Parloa was a contemporary of Sarah Tyson Rorer, whom I wrote about in my post on chocolate cake. Like Rorer, Parloa was a cooking instructor and author, and one of our nation’s first celebrity chefs — even though, like Rorer, she’s now virtually unknown. She was a leader in the home economics movement (then called “domestic science”) and founded several cooking schools, first in Boston, then in New York. 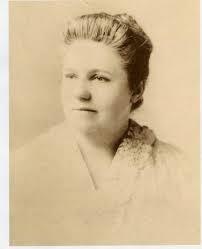 She also taught young immigrants for free in the evenings, and later in her life took in several orphaned girls, perhaps because she lost her own parents at a young age. My first thought was that Parloa suggested whole peaches in her pie recipe to make it easier for her readers, but pitting isn’t that hard — she probably just believed the pie would taste better. But most of the old cookbooks I checked called for stewed peaches, or at least pitted and peeled ones. Peach peel was generally considered bad for the digestion. I should note that modern-day peaches should only be left unpeeled if they are organic, as this fruit can be highly contaminated with pesticides. Parloa’s pie turned out to be more challenging than I expected. 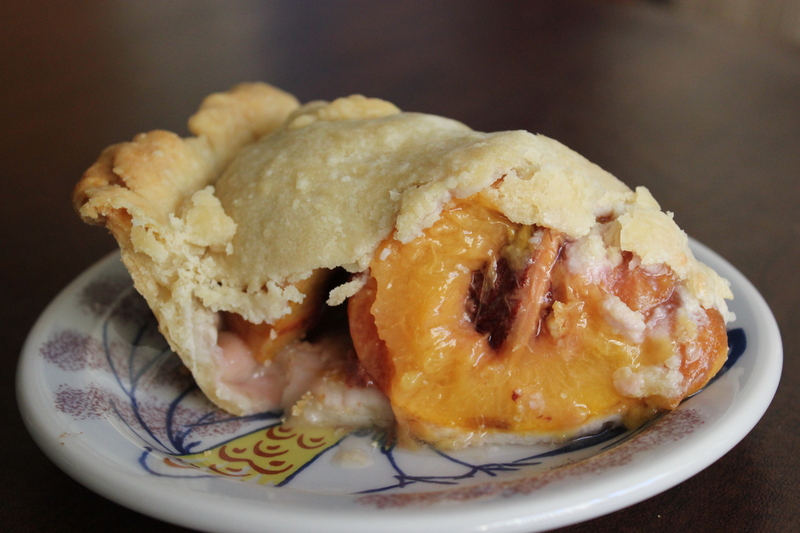 Although leaving the pits in saved time, it was hard to lay the top crust over the bulging peaches. If you used a deeper dish this might be easier, but I had only a regular pie pan. My top crust ended up looking like a mogul hill. I’m going to try this again someday when my kitchen is less warm and the dough more cooperative. Appearances aside, however, the pie was terrific. 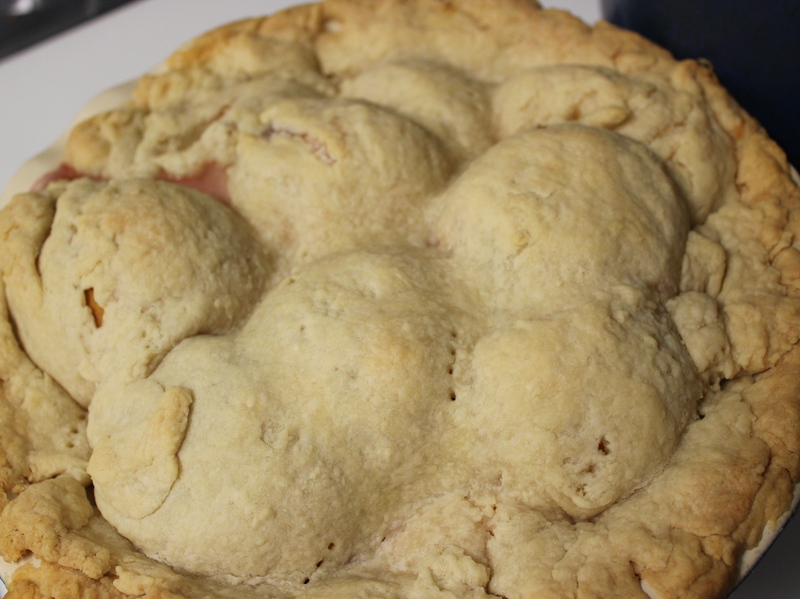 I think leaving the pits in kept the peaches firmer, and the pie had a profoundly peachy flavor. It was slightly soupy, but not so much that the crust was affected. We all loved this pie. You can serve it with whipped cream or ice cream, but it’s great without any accompaniment. It may not be quite the thing for a fancy dinner party, but it’s a really good pie. Just remember to warn your guests about the pits! 1. Preheat oven to 425°F. Roll out the dough for the bottom crust and line a pie pan with it. Remove stems from peaches, and peel if using nonorganic fruit. Place four unpitted peaches in the pan. Cut the remaining two peaches in half and remove their pits. 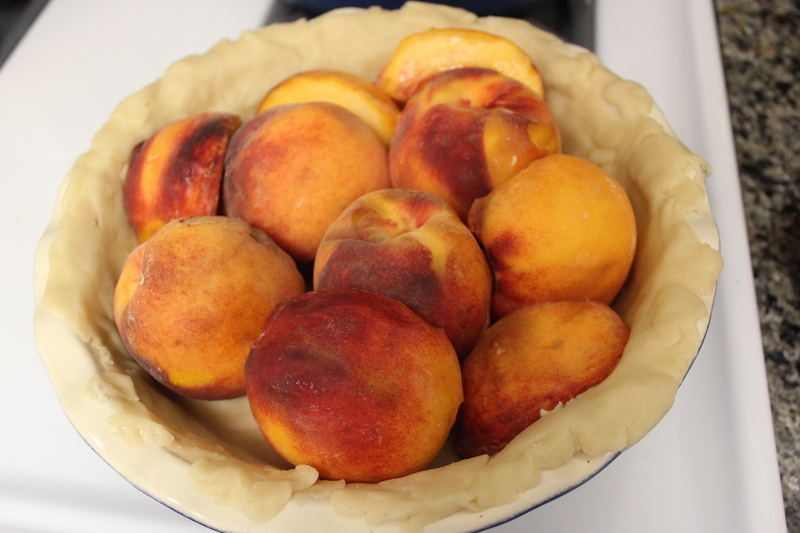 Place these sections between the other peaches (cut the halves into smaller pieces if that will help fill out the pie). 2. Sprinkle the sugar over the peaches, followed by two tablespoons of water. 3. Roll out the other ball of dough and carefully place it over the filling. Crimp the dough’s edges to seal, and cut a few small slits in the crust with a knife or fork (if you haven’t already gashed holes in your crust trying to lay it over the giant peach mounds). 4. Bake the pie for 10 minutes at 425°F, then reduce heat to 350°F and bake another 40-45 minutes. Let rest an hour or so before serving. 1. In a large bowl, stir the flour with the sugar and salt. Add the butter and shortening and mix into the dough with two knives or a pastry cutter, until coarse crumbs form. This entry was posted in desserts, pies and tagged 19th century food, Appledore Cook Book, food, food history, foodways, history, Maria Parloa, peach, pie, Sarah Tyson Rorer by revolutionarypie. Bookmark the permalink. Oh my… could that pie BE more delicious-looking?!! I really love the bulbous look of the whole peaches – makes the fruit look so succulent and abundant! I also appreciate that Parloa wrote for the domestically challenged… to me, Blanch, Braise and Baste sound like a 70’s cover band. You might be interested to know that many 19th century cookbook authors (women authors, BTW) were concerned that young women no longer learned how to cook properly — Parloa and others felt culinary knowledge wasn’t being passed down, especially bread baking. Of course, they didn’t anticipate the phenomenon of takeout food — or of husbands cooking dinner! Thanks, Karen, for the post! Fascinating recipe! Interesting that Ms. Parloa included the pits as a flavoring. Peaches are a Prunus species, related to the bitter almond (as are apricots and cherries). Bitter almonds were commonly used in 18th and 19th century cooking, generally in combination with sweet almonds but in much lesser quantities. The seeds of Prunus fruits contain Glycosides which break down into glucose and Benzaldahyde — a natural almond flavoring. I have heard people who have eaten peach pits describe them as tasting like almonds — a practice that I would not recommend, because unfortunately, the third component resulting from this catalysis is cyanide. Eating raw pits is of far greater concern than cooking with pits, as cooking destroys the cyanide-releasing enzyme in the plant material. 100 grams of RAW peach pit meat, (that’s only about a dozen pits) apparently contains between 90mg and 180mg of the stuff…an amount you don’t want to mess with. Should that knowledge keep anyone from trying this pie? Absolutely NOT! Especially if it’s eaten in moderation and served warm with a scoop of top-shelf vanilla ice cream. I draw the line, however, at eating peach pits raw. Thanks for all this information, Kevin! It’s funny because while eating this pie, we lectured our daughter on the dangers of apple seeds, and yet it seems our pie was full of cyanide. I did see references in a few books (like Miss Leslie’s Directions for Cookery) to cracking peach pits and using the kernels for their almond flavoring. I don’t think I’ll experiment with that, but as you say, this pie seems safe enough. With a nice scoop of ice cream, it’s worth any small risk. 😉 I’m now wondering if I could taste the almond flavor … I’m not sure. I’ve wondered why Hunza Apricot seeds are considered a superfood, can you shed any light– is it the fine line between medicine and poison thing? I’m afraid I don’t know. I looked this up, and maybe you know this already — apricot kernels contain amygdalin, which some believe helps fight cancer, but studies don’t confirm this. I also read, however, that the kernels are used in Chinese medicine for various ailments, so perhaps in small doses they’re good for you. Sounds a bit risky, though. The fruit inside the pit is the poisonous part, right? I can’t imagine much of the flavoring seeping out? Yes (about the poison), and no, I doubt much almond-like flavoring would seep out. I think we just tasted peach. But it was gloriously peachy! I love this, and I love the lumpy picture. I’ve just been in old-time Welsh pie mode (plum-apple and marrow) and the two things that strike me about your piece is one) plate and two) adding water. Re the plate– I actually ordered an enamel tin pie “plate” on ebay to figure out if there was something special about the really flat base for making pies. I found the deeper ones felt more familiar to use but I want to investigate. And two– water– add water to plums? I was so happy I avoided that instruction, and happy that I really drained the squash of excess fluid over a day… Wouldn’t their pies have been really liquid? Also contemporary fruit pie mixtures seem to request thickeners (flour, cornstarch, tapioca, etc)– I wonder when the practice of recommending these started, or perhaps people used to use less ripe fruit? Hmmmmmm…. Anyway would love to eat your pie indeed! I wondered similarly why Parloa recommended adding water to this pie. I’m not sure whether pies used to be more watery. I do think they were often baked longer, so perhaps the water escaped as steam. I’m not sure… About thickeners: I don’t believe cornstarch was used in food preparation until the latter 19th century. Tapioca was used in puddings, but I don’t see it mentioned in 19th-century cookbooks as a pie thickener. But I’m not that familiar with this era yet, so I could be wrong. If I can shed more light on this, I’ll let you know!